Trowell Garden Centre is an independent family owned and run garden centre set within an old quarry. It has a great restaurant and a fantastic selection of plants and goods available. Our store is located within the main centre and we have an all-weather covered water gardening section. We stock African Cichlids, Discus and invertebrates, fresh water shrimp and Dwarf cichlids just to suggest a few, not to mention the vast amount of unusual "community" species we have to offer. Our Dutch quality aquarium plants are delivered freshly every week to ensure you always have a great choice. We also specialise in "L-number" Plecs and stock a wide variety. This fantastic fish frenzy is of course supported by everything you need in our well stocked accessories department. We have brilliant choices of specialist feeds and conditioners to help keep your prized specimens in top condition. Be sure to see our exclusive ranges of aquariums and cabinets. We can have glass tanks made to order in almost any size, pop in and discuss your requirements. Our live food is delivered every week and we are happy to take orders to ensure you have a regular supply. There is a great selection of marine fish and corals available next to our 8 foot coral reef display. We also have pre mixed salt water for sale using the highest quality reef salt and properly circulated to ensure a precise mix (we never mix it in your water container). If its water gardening you need, then our pond section will be able to help you. Pumps UV’s and filters as well as a great selection of Koi and other pond species. A good variety of liners and pre-formed ponds are also kept in our all weather pond section. Our plant selection feature UK grown plants including many native species so you can create that perfect wildlife haven in your own garden. We also have a selection on water features and waterfalls to compliment any garden. 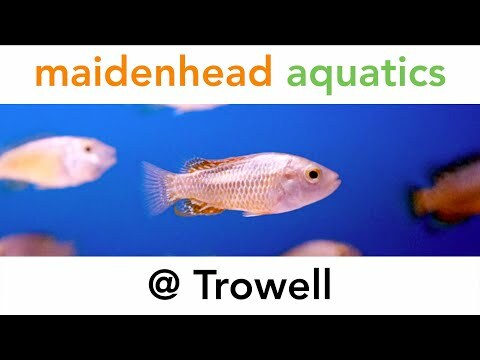 Our friendly and helpful staff are on hand to assist, whether you are new to the hobby or are an experienced aquarist we are looking forward to welcoming you in store soon.